This year’s first open thread on climate science topics. Usual rules apply – and let’s make a particular effort to stay substantive and not devolve into empty bickering (you still have Facebook for that). Any expectations or predictions for climate science in 2019? Regarding ice and energy, I get that SLR from ice (not thermal expansion) is not just straight up melting, but more importantly ice sheet collapse from ice shelf melting resulting in increased flow into the sea. I was just curious about how the extra energy in the system compares to the amount of ice ultimately available for melting. I ended up looking it up myself, but from a variety of sources unfortunately from different dates. It is such a BOE thing I didn’t bother nailing everything down. Also my significant digits are off. I got total ice on earth of 33mm km3, or 30,261 x 10’15 kg. At 334 kj to melt 1kg, I figured 10.107 x 10’24 j to melt all the ice on the planet. In a skeptical science post, I saw a 2012 estimate of 8 x 10’21 j of extra energy added to earth from AGW each year. At that rate, if all the energy was put to work melting ice, I figured it would take 1,263 years to melt all the planet’s ice. Again, if 100% of the energy went to ice melt, each year 26,200 km3 of ice would melt. If 395 km3 ice melt yields 1mm of SLR, that would be 66mm of SLR per year. As a reasonableness check, if only 3% of the current energy goes to melting ice, that would be 2mm per year SLR. Given that current SLR is 3.4mm per year, including thermal expansion, I think I at least have my orders of magnitude right. Taking it a step sideways and further, I figured it would take about 121 x 10’21 j to melt enough ice to raise SL 1 meter. Given that the current increase in OHC since 1940 is estimated at 427.3 x 10’21j, if you dropped (or slid) into the ocean enough ice from the sheets to raise SL 3.53 meters, the melting of those ice cubes would use up all of the extra OHC people are responsible for. Cooling the ocean might not be great for the coastlines, but it would work wonders for the coral reefs. Is this a thing, that melting massive ice discharge into the ocean would cool the ocean materially? It would seem reasonable to expect disruption of ocean currents, weather patterns, etc. I realize most of this doesn’t have anything to do with the way the earth system absorbs and distributes heat, was just curious. Science — there’s always more to look into. A second worthwhile story for the “skyrocketeers” to start bleating about, this one from the Met Office (comment of which I hopefully post on the right thread ths time, unlike the last). Mind I hope they note that the Met Office prediction is for monthly MLO CO2 readings peaking in May at 414.7ppm, and perhaps also that they were a tad high with their predictions last year (by about 0.9ppm). The Met Office forecasts an average CO2 level in 2019 of 411ppm. Monthly averages are expected to peak at 415ppm in May, before the growing season temporarily reduces levels to 408ppm in September, when CO2 will begin rising once again. The level of CO2 in the atmosphere before the industrial revolution sparked the large-scale burning of coal, oil and gas was 280ppm. Isn’t that unlikely? I thought the air masses tended to flow west to east round the globe? Isn’t it too far from LA for an air pattern to move continental air that far west? If something like that as behind these spikey numbers I’d be looking toward Chinas direction or maybe the forests of Borneo or Thailand or something (?) like that. also imo emissions numbers are too unreliable with with too many ‘assumptions/estimates’ making them up. both recently and in years gone by to be able to fairly make any comparison to PPM. PS besides the issue is CO2 levels. That’s what drives the temps up, no matter where that CO2 comes from human or natural sources. It’s well known one of the consequences of higher human emissions leads to higher temps which must then lead to forcing of CO2 out of the natural reservoirs of vegetation and soils by various mechanisms through changes in max temps and drier conditions in hot spots. For all we know atm maybe something like this happening somewhere without an el nino being the main/obvious driver this time. weather and climate has already changed substantially. This is probably better suited to the Forced Variations section as it is way off topic for climate science. Look for a reply there, or I could email you–as this is a subject I have given a lot of thought to. Our first global surface temperature record posted for December is Berkeley Earth as both NOAA & GISTEMP use ERSST which has been caught up in the tantrum of the child on Pennsylvania Ave. BEST uses HadSST so is unaffected. BEST posts a December anomaly at +0.87ºC, a bit of a rise from November’s +0.74ºC and the third highest anomaly of 2018 (behind April October). The range of the monthly anomalies for the year was from +0.91ºC down to +0.69ºC. It is 4th warmest December in BEST behind previous warm Decembers 2015 (+1.09ºC), 2017 (+0.90ºC) & 2016 (+0.89ºC). December 2018 is the 25th warmest monthly anomaly on the full all-month BEST record. Of the last 10 years, only two years are not in this top-ten, but they are not much cooler than tenth spot – 2012 (14th +0.60ºC) & 2011 (16th +0.59ºC). But can one make such a choice? In my experience, belief isn’t really a matter of choice; it’s a matter of perception (including deep reflection and experience). Good comment, Kevin. I’m also an atheist, in the classical or dictionary sense (can’t say I care much for the definitions of ‘strong’ and ‘weak’ atheism, however). I nonetheless recognize the need to assign subjective priority of preference to some states of the universe over others: a requirement that science can’t help with, other than to inform us of the range of likely states. It seems to me that belief as you’re describing it is only the conscious outcome of a lengthy and complex chain of unconscious cognitive processes, each with proximate and ultimate causes. For example, I have little doubt my personal ethical stance owes much to my instantiation of the Homo sapiens genome; to six years of Sunday school in my parents’ liberal protestant church, before digging in my heels at age 12; and to the rest of my upbringing as the son of a science professor in a university town. Then there’s everything that’s happened since! I would say that ‘free will’ exists, but only within very limited behavioral ranges, under a narrow range of conditions. My participation on RC, for example 8^). Researchers argue a permanent presence on Heard Island is critical because they believe it holds clues to understanding not only the earth’s formation, but also its future. Heard Island has 12 major and several minor glaciers that together cover 70 per cent of the island. They are shallow and fast flowing, meaning they respond very quickly to a warming climate. UNESCO said the glaciers on Heard were responding to climate change “faster than any glaciers elsewhere, making them particularly important in monitoring climate change”. to Hank at 196: are you making things sound worse than they really are? You say “Antarctica gets ready to uncork a rush of glaciers to the sea, as sea ice disappears.” but the article says the rate of loss is close to 2005 and and 2010. Yes, it’s the fastest rate of loss in the satellite record, but do you really think Antarctica is getting ready to uncork a rush of glaciers to the sea? Is it that different from 2005 and 2010? I don’t track Antarctic sea ice and glacier loss. Maybe you are correct, but since you have urged folks here to not make too much of certain stories or measurements, I feel like it makes sense to ask you to be careful as well. Sound right? to Carrie at 189: Better day on CO2, yoy increase dropped back down after a few pretty spikey days. I read somewhere that we are likely to move into EN conditions in 2019. If that turns out to be true, then we will see some big yoy comparisons. Emissions for 2018 were in rise mode, so it makes sense that we would be seeing a little jump, but the story remains unchanged: we need to see the CO2 rise number start dropping toward zero and I don’t see it yet. It would take several years (preferably 5-10) to be persuasive to me, but emission numbers for 2018 have probably made it more difficult to spot a positive trend like that for now. The emission and accumulation numbers are currently going in the wrong direction and I don’t think it’s possible to identify any change in the trend at this time. The CO2 numbers don’t need to “skyrocket” (whatever that means?) to be troubling. They are troubling numbers if they simply keep going up. 410 ppm is not where we want to be. … the ice sheet is now sensitive to small fluctuations in summer temperatures, and if global temperatures continue to rise as predicted, soon Greenland’s summers will be warm enough to cause massive melting regardless of the NAO’s phase. But here’s the thing about those long-term climate change concerns: So far, they have a tendency to arrive much earlier than expected…. Oh, yeah, there’s more. Oops. While melting ice sheets and sea-level rise get lots of attention, Michael Mann, a climate scientist at Penn State University, points out that climate change is also already having dramatic effects on extreme summertime weather events. In a Science Advances article from October, Mann and his colleagues identified a key mechanism by which climate change influences extreme weather events that current climate models had failed to capture: a misbehaving jet stream. The team found that climate change was causing the once-meandering jet stream to stay in place, trapping high or low pressure systems in place in the atmosphere, which, in the summer of 2018, led to extreme heat waves, drought, wildfires, and flooding across the United States and abroad. Not an expert on air transport through still porous ice, but I would think that air has a hard time diffusing through meters of ice, so the trapped air is probably closer to the age of the surrounding ice than your estimates. The article includes the observation that food systems enhancement via human-managed polycultures persisted through climate changes. A key aspect of what I would term regenerative systems is the extensive management of water. I wonder to what degree the human-mediated infiltratiin of water affected droughts, forest extent changes, die-offs, etc? To answer my own question about ice melt materially cooling the ocean, of course the answer is yes. Hansen’s Ice Melt paper, figure 6, shows 2096 surface air temperature 0.33 C *below* an 1880-1920 baseline, assuming an aggressive ice melt doubling time of 10 years, which would equate to a 5m SLR by that time. If I’m reading the map right, the UK would be 10 C colder than the baseline, a different catastrophe than we’re used to considering. wrt to sea ice loss, etc. : all we have to do is take immediate and drastic action to avoid the worst-case climate scenario. The emphasis on the worst-case scenariou can be disheartening to human beings. We need to stay optimistic and cheerful so that we do not lose momentum to build on the changes that we have already made. Apparently, we only have to step up our actions to a certain extent and we are in the clear. I am not clear what exactly would qualify as immediate and drastic action. I think that needs to be spelled out so that we all know what needs to be done. Chin up, everyone. Stay positive! Keep up the good work! Immediate and drastic action! How hard can that be for a species like our own? If you want to see the whole 15 page report click “Download the Full Report”. Clearly the US emissions are falling while most of the rest of the world, including the EU with their carbon taxes, are rising. Emissions in China and perhaps India are exploding – mostly fueled by money from exports, much of that to the US. Clearly US has lifted the entire developing world from poverty in just the last few decades by outsourcing our manufacturing, and leaving many ‘Muricans with low-paying jobs, while China houses millions in concentration camps. That’s the harsh reality – quite the opposite to the rosy China picture painted by many in posts above. As my handle states, I’m no expert on this subject. I can’t understand how the above can be true. Cold water should be denser, unless it’s right about freezing, such as ice –> meltwater and ii) at least the Arctic and now it seems the Antarctic are melting. ii) how is more melting causing the Gulf current to sink less rather than more? I’ll take a shot at it. Sea water is more dense than fresh water because it contains dissolved salts. The warm Gulf Stream sea water moves on the surface of the ocean as it heads north, and as it heads north, it cools to the increasingly colder atmosphere. After it’s gone far enough north, it cools enough that it is now more dense than the water just below it, so it dives down into the ocean. However, with a warmer climate due to global warming, as the Gulf Stream goes by Greenland, it is mixed with more fresh water from melting glaciers than before warming occurred. The mixed Gulf Stream + fresh water is less dense than sea water because it is less salty. Thus, it stays on top of the ocean, does not dive down, and that shuts off the Gulf Stream. Al Gore explained this in his movie, “An Inconvenient Truth”. Whether water sinks or rises depends on its buoyancy, which in turn depends on its density. Seawater density depends mainly on its temperature and salinity. Warm water evaporates more than colder water, so its salinity increases. When it reaches polar regions, it cools, and the additional salinity is sufficient to raise its density above that of the surrounding water. Hence it sinks. Ice water is fresh, so it dilutes the salinity, resulting in the Gulf Stream water remaining near the surface. This reduces the subsequent flow of the Gulf Stream, decreasing heat transport to the pole. 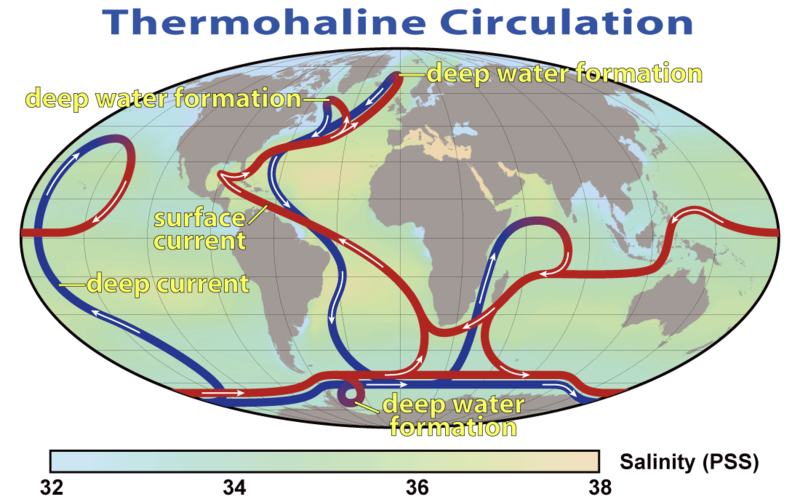 Look up thermohaline transport or global ocean current models. Here’s a (to me) new front in attacking conventional climate science: N2 and O2 are actually greenhouse gases too! I first ran into this curious claim in the comments section of an article on climate change on FT.com. A comment by someone using the handle “Galileo’s Revenge” (of course, eye-roll) insisted that Raman spectroscopy shows that N2 and O2 also absorb in IR and that he was about to publish on the topic. Seemed a pretty obvious misunderstanding of how Raman spectroscopy works, and after explaining this I dismissed it. And then just yesterday, someone on Facebook used this link (http://www.academia.edu/37577750/Quantum_Mechanics_and_Raman_Spectroscopy_Refute_Greenhouse_Theory) to suggest that our understanding of global warming was based on a fundamental misapprehension about greenhouse gases. I do believe the author of this “paper” is the same Galileo’s Revenge I ran into. But famously, “one swallow does not a summer make”–nor does one year suffice to characterize a nation’s emissions trajectory. In the United Kingdom, emissions dropped by 3.8%, or 15 Mt, to 350 Mt of CO2, their lowest level on record back to 1960. In Mexico, emissions dropped by 4%, driven by a decline in oil and coal use, efficiency gains in the power system, strong growth in renewables-based electricity generation and a slight increase in overall gas use. Japan’s decline was also about 0.5%, so if we were giving Olympic-style medals based on relative emissions declines, Mexico would get the gold with the UK close behind for silver, and the US and Japan well back in a tie for third. China’s economy grew nearly 7% last year but emissions increased by just 1.7% (or 150 Mt) thanks to continued renewables deployment and faster coal-to-gas switching. China’s carbon dioxide emissions in 2017 reached 9.1 Gt, almost 1% higher than their 2014 level. While China’s coal demand peaked in 2013, energy-related emissions have nonetheless increased because of rising oil and gas demand. Clearly, emissions in the last several years are not behaving as was the case from ~2000-2010. In India, economic growth bolstered rising energy demand and continued to drive up emissions, but at half the rate seen during the past decade. Nothing equivocal about that–per the IEA, there’s nothing ‘splodey’ about Indian emissions over the last year or two. Like China, there is a structural transformation of the energy economy underway, with large numbers of coal plant projects cancelled, and large deployments of renewable energy coming instead. Emissions in the European Union grew by 1.5%, adding almost 50 Mt of CO2, reversing some of the progress made in recent years mainly due to robust growth in oil and gas use. The rate of energy intensity improvement slowed to 0.5% down from 1.3% the previous year. So the 2017 increase is not typical (though obviously it is unwelcome). –The gold medal for emissions reduction would go to the Russian Federation, whose emissions are down ~50%. Too bad about the economic collapse, though. –The silver goes to the European Union, whose emissions are down ~20-25%. Of course, Chinese emissions really did ‘explode’ in the early part of this millennium, and are up something on the order of 300% since 1990. India’s increase has been slower and more gradual, but nevertheless has amounted to something like the relative increase seen in China, though from a much lower baseline level. If you hover above the graph trace, the value for the year will appear, so you can calculate precise increases. For instance, selecting the India case (’cause I’m curious), you find that the 2014 emissions were 2,238,377 kt, whereas back in 1990 they clocked a mere 619,154. That puts the increase at ~361%. Good thing there are some signs of change; were past Indian (quasi-exponential) trends to continue, we’d all be well and truly screwed. Even now, there’s reason for serious concern. Kind of a dramatic difference since 1982. Maybe the Kyoto Accord wasn’t such a failure, after all! NonScientist, I’m sure you’ll get lots of responses from actual experts, but my understanding is that the warm water of the Gulf Stream becomes denser as it cools and evaporates on its way northeast at the surface. Because density increases with both cooler temperatures and higher salinity, when the GS water reaches the vicinity of Iceland it sinks to the bottom. Greenland meltwater, even at 4 degrees C, is less dense, so that if it floods the North Atlantic the downwelling is interrupted, and the Gulf Stream grinds to a halt. NonScientist, I’m sure you’ll get lots of responses from actual experts, but my understanding is that the warm water of the Gulf Stream becomes denser as it both cools and evaporates on its way northeast at the surface. Because density increases with cooler temperatures and higher salinity, when the GS water reaches the vicinity of Iceland it sinks to the bottom. Greenland meltwater, even at 4 degrees C, is less dense, so that if it floods the North Atlantic the downwelling is interrupted, and the Gulf Stream grinds to a halt. Bummer. One word I would have for non scientist with his question about water temperature and how the streams flow and circulate is “salinity.” The flow is affected by many factors, but when you are considering what happens to the amoc near Greenland, you have to pay attention to the fact that Greenland ice melt delivers cold fresh water to the Labrador Sea and North Atlantic. I think that’s correct and accurate, but others will let us know if I have details wrong or have missed something big. The radiation dose rates from measurements obtained over the last four years exceeded trends from previous solar cycles by at least 30 percent, showing that the radiation environment is getting far more intense,” study lead author Nathan Schwadron, a professor of physics at the University of New Hampshire’s Space Science Center, said in a statement. “These particle radiation conditions present important environmental factors for space travel and space weather …. What we say is quite true. Not so much (earth didn’t get hot). It’s just a matter of degree. More proof needs to be found. That temps won’t again rebound? Anyway, I just wanted to express annoyance at the unpleasing noises coming from the choir, and ask whether the air pollution argument carries much weight. The description that Hank cited is clearly *very* “dumbed down.” In other words, I think it was probably meant to be indicative, not really descriptive in any full sense. And from what reading I did, I suspect that the matter is not yet fully clarified for anyone, scientist or not. Clearly, it is complicated, with many competing effects to untangle. One thing it does say pretty clearly, though, is that lower densities at depth in the Labrador Sea–off Southwestern Greenland–have been measured during the peak times of the ‘cold blob.’ Hold that thought for a bit! It takes a fairly wide temperature swing–~30 C–to induce a comparable density change in water. Looking at sea surface temperatures using the climate reanalyzer, you can see the temperature patterns associated with the Gulf Stream. The the main branch (warmth) really doesn’t get anywhere near Greenland; rather it is manifest in a fan-like warm swathe across much of the western coastal waters of the North Atlantic, extending more or less from Portugal to the British Isles. (I.e., the waters off Portugal are at 15 or 16 C, those off northern Scotland at maybe 8 or 9 C–and those off New York, which is more or less at the same latitude as Portugal, at maybe 5 C.) So the density swing associated with that cooling isn’t much. But the Gulf Stream water isn’t just warmer; it’s saltier, too, since its surface has been subjected to high evaporation rates during its genesis in the tropics. So at some point the density overcomes temperature, so to speak, and the water sinks. For the Gulf Stream the main ‘trunk’ is as I described it above, running from North American east coast to Europe. But there is an offshoot that diverges toward Greenland, creating an area of ‘deep water formation’–an area where this sinking occurs–southwest of Greenland. That’s the area they focus on in the paper I linked above–the area where the density decreases at depth were measured. That’s where things start to get uncertain for me. If you imagine the ‘lens’ of cold, fresh water as fairly discrete in comparison with the saltier Gulf Stream water, then you imagine the latter tending to dive under the former. But that would imply enhanced deep water formation, while Hank’s citation asserted the opposite–that is, *inhibited* deep water formation. So, what if the water masses tend, for whatever reason, to mix? Presumably, you’d end up with a much thicker (deeper) layer with a much more gradual gradient profile. It might make sense that that setup could work against current strength. And if the speed of the current drops, then less heat is being advected into the area, and the area will tend to cool. Likewise, salinity–if less salt is being advected in on average, then salinity, and therefore density, would presumably tend to drop, too. So it might seem as if there is a potential feedback tending to stabilize the lower deep water formation setup. But all of that stuff below the line is really just speculation on my part. Yes, well OK. Denial, obfuscation, playing word games, and outright dishonesty might help. Or it won’t. Oh, is that all? Daily’s back down at 410 to 411. Unlikely to last very long before rising again to the 413s. I think that some of the nuance in that piece got garbled. Any time you have low solar activity, you will have increased galactic cosmic ray flux. The previous solar minimum was the wimpiest of the space era. It was deeper and lasted longer than any we’ve seen in the past 70 years. As a result GCR fluxes were 8-20% higher (depending on particle type). The Solar Minimum we are just entering looks as if it will be similarly wimpy, and the Solar Maximum just completed was quite wimpy as well, with relatively few big solar particle events. Galactic cosmic rays are a significant concern for several reasons. They are more likely to cause electronics to malfunction (single-event effects), and they also cause more serious damage to DNA, due to their high energy and ionization potential. They’re also nearly impossible to shield against. Solar particle events, which are generally more likely when the sun is more active are generally short term distrubances–a few days to a week or so. However, they can resulty in pretty high doses over those periods. One of the biggest measured solar events hit roughly midway between the Apollo 16 and Apollo 17 missions, and could have represented a serious threat. Thanks to all for your responses. I ask these questions bc I now have cognitive decline and need to digest information in quite small bites. The Bureau’s ENSO Outlook has therefore moved to El Niño WATCH, meaning there is approximately a 50% chance of El Niño developing during the southern hemisphere autumn or winter. Feel free to check any official MET/ENSO info website. Maybe another mass bleaching event could raise it’s head on the GBR and other southern reefs before too long. More 413s right around the corner. Am curious what May 2019 will produce at MLO and Globally. I’ll just have to wait till the numbers come out. Are their any indications that sudden stratospehric warming has over time increased the heat radiated from the top of the atmosphere ? As a lay person who takes a keen interest in following climate science I am wondering if this can be visualised as a negative feedback by the climate system burping some of the excess anthropogenic heat away. Concluding an admonition to depoliticize something with a link to Politico often ends as badly as predicting that the world will end before you leave the White House. Researchers say a massive cavity the size of two-thirds of Manhattan was found under a glacier in Antarctica. The pocket is a sign of “rapid decay” and just one of “several disturbing discoveries” made recently regarding the glacier, NASA’s Jet Propulsion Laboratory said in a news release Wednesday. The growing cavity sits in West Antarctica at the bottom of Thwaites Glacier, which is about as big as Florida and contains enough ice to contribute more than 2 feet to sea level rise, NASA said. It is growing at an “explosive” rate that surprised researchers conducting a study the agency led on the glacier…. … That’s what I called the “Ice Cube Catastrophe” scenario — a sudden rumble, the ice cap becomes crushed ice and rushes to the sea…. Mal Adapted, #694 on Forced Responses (I’m replying here because the dialog box is gone from that lengthy thread, maybe because of the new month). A good article by Jared Diamond. His comments re:population are right on. His summary, “Forced to choose between limiting population or trying to increase food production, we chose the latter and ended up with starvation, warfare, and tyranny.” So true. Yet we’ve also got something else to show for this millennial long experiment in agriculture and population growth – art, science and technology. True he does say, “While post-agricultural technological advances did make new art forms possible and preservation of art easier, great paintings and sculptures were already being produced by hunter-gatherers 15,000 years ago, and were still being produced as recently as the last century by such hunter-gatherers as some Eskimos and the Indians of the Pacific Northwest.” Yet that’s a bit shallow compared to what modern people have accomplished in these areas. Those pre-modern art items are, by contrast, valuable mainly because they exist at all. If I were prone to wild speculation, and I am sometimes, I’d say that if there’s anything to causation, it might be that we were meant to go down the agricultural/population/development path just so we could create these things- art, music, science. But that now that we have done so, and are on the edge of AI (which can much better simulate Julian Simon’s ‘the more heads working on a problem the better’ doctrine) which can continue that progression, our growing human numbers are no longer justified, and, in fact, as everything now indicates, are a serious threat to the existence of the biosphere. A confluence of factors thus indicates that it’s time to scale back, and combine the best of both worlds: the primitive and the modern. Actually, AOC is correct. The world AS WE KNEW IT is dying right now. Yep, there will be a “new” world no matter what humans do. But AOC is correct even if she’s too young to realize that “old age and treachery will beat the truth every time”. Caveat, AOC, caveat because R______ has NO interest in truth, but is solely interested in being “proven” correct via, well, figure it out, guys. Now you’ve done it. Forced me to comment against my will and better judgement. So just as a thought experiment, if you kill off your brain cells one by one, at what point does your (completely undetectable) ectoplasm exit your body for more promising haunts, leaving behind a corporeal husk that is religiously dead? My understanding is that synapses either excite or inhibit rather like fuzzy switches that have evolved (as you might expect: cause and effect leading to cause and effect) in a large, complex open system that provides sufficient, sustained energy. Eventually such an environment should create ever more efficiently functioning brains that become inclined toward seeking reality-based, novel substrates upon which to grow and reproduce –to become interested in science and to visit sites like RealClimate, seeding it with provocative if occasionally OT musings. No? By my Ka and my Ba, dj ‘ankh mj R’ djet!